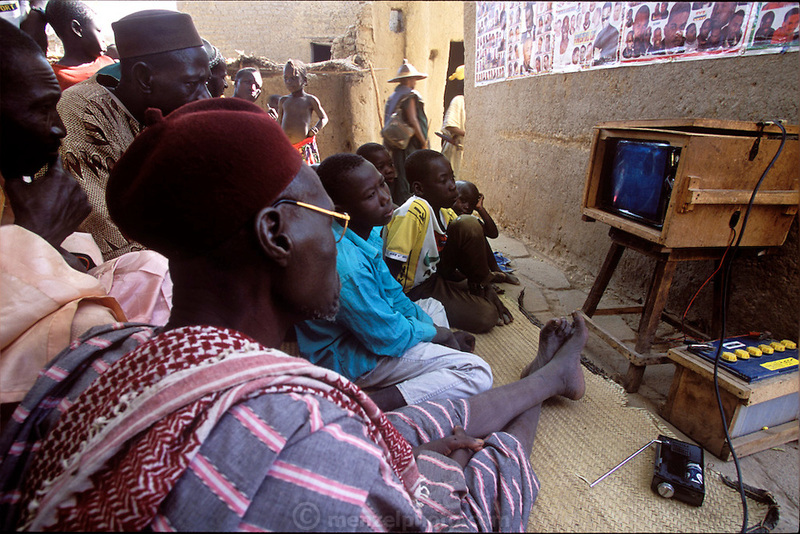 An American documentary about a Los Angeles SWAT police team show being watched by Soumana Natomo and other men and boys in the village of Kouakourou on the banks of the Niger River in Mali. There is no electricity in the village. The television is powered by a car battery that is charged by a photovoltaic solar cell on the roof of the pharmacy behind the men. (Supporting image from the project Hungry Planet: What the World Eats.) The Natomo family is one of the thirty families featured with a weeks worth of food in the book Hungry Planet: What the World Eats.